Markus Eder has followed the well-trodden path from the park to big-mountain. Nowadays he's making a strong case for being called the most versatile skier on the planet. 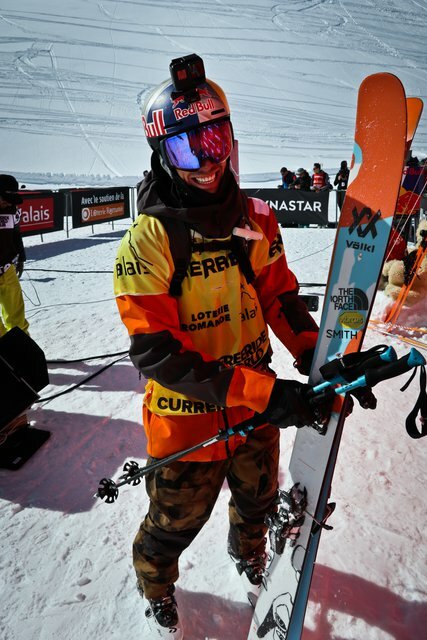 He competed in slopestyle at Sochi, yet just won the Freeride World Tour. And just to show he hasn’t forgotten his park roots he occasionally goes back home to dominate 60-meter monster rails. 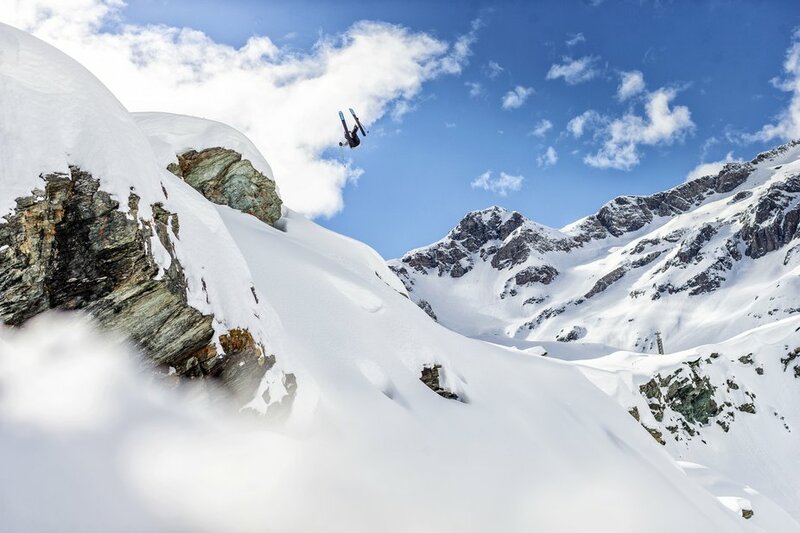 Markus, you finished 2nd on the Freeride World Tour in 2018. Last month he went one better and claimed the men’s 2019 ski title, so what made the difference? I think I was just that little bit more focused, I really wanted to win. Since the summer, my objective was to win. Last year I was doing quite a lot of other projects too, but this year I just focused on the tour. I couldn’t really think of anything else, I think that’s why. I don’t really know, it just worked out. Competing on the tour last year, you really find out how it all works, you go through the whole ranking. Last year was my first time on the whole tour, before I only did six stops. Understanding the system, and you’ve gone through all the emotions already, means you just know what’s coming. You had a healthy lead going into the final stop of the tour, in Verbier. When did you know you’d won the title? I actually found out about it before dropping in for my run. My buddy, Fabio Studer, called me up telling me that Kristofer (Turdell) was second at the time, that made me the world champion. I was super-freaking stoked! Definitely had some tears coming down, because it meant so much to me. I also felt much more relaxed, confident and stoked about dropping in. So Tanner Hall was on the FWT 2019. What was that like?! Having Tanner on the tour and seeing his passion for skiing, all of us riders were blown away by how much he went out there getting after it. Every day he went out, skied crazy sh*t from early morning to evening, stacking shots. When it came to the comps, he was hyped for everyone to do well, even if he didn't nail his own run. Just so much love for skiing and he keeps pushing hard right now, in Tahoe. I can't wait for his movie to drop. In Andorra, he seemed to live at the Sunset park, without ever taking his boots off! You’ve competed in X Games, won the FWT and even competed in the first Olympic Slopestyle in 2014, what are the main differences in approaching these comps? I’ve competed since I started freestyle skiing, the main difference, for the tour, is that you only have those five runs. You have to be consistent. You have to put so much effort into scoping, so you don’t make a stupid mistake, which could screw you up in the overall ranking. It’s just so easy to crash, something can always come up, so you need to make sure there won’t be any surprises. That’s pretty rough, having the inspection, without being able to touch the snow. It’s just hard to ski well consistently throughout the season. Every stop, you had to go pretty hard, because this year the level was so high. In slopestyle, in that Olympics, we had 5 practice days. Completely different to the FWT. In slopestyle, you know the speed and you just completely focus on the tricks. On the FWT, it’s everything between the airs that you have to consider. Where do I go? How do I not lose myself in the line? How big are the cliffs? That all takes quite a bit of time. If you haven’t been a film skier or a competition skier, you could be the best freerider, but if you’ve never put a lot of time into scoping, you won’t do well on the Tour or the qualifier. Last year you did switch takeoffs and even butters on the FWT. Is it still important to add freestyle elements in to your run? Yeah, for sure. I didn’t do that many different tricks this year, I did flat-spin 3 and backflip, but I was always looking for something unique. I couldn’t be that happy about a line that most people had been through, even though it would probably be a fun run, but I want to do something special and find those special hits. I like to stay on the mountain that bit longer and try to find them. There’s crazy-steep downhill take-offs with high speed landings, but I’d rather take those side-hits and transfer airs, where you can go just as big or even bigger sometimes, but having less consequences. They’re harder to find but definitely nicer to ski. The skiing was dominated by Italians this year, did you already know Arianna Tricomi before? Arianna also used to be a freestyle skier when she was younger, but we only really started to hang out last year, on the tour, that’s when I got to know her. It just seems that freeriding really sparked that fire in her. She’s good company! So, aside from winning it, what were your highlights this year on the tour? Seeing Kristofer (Turdell) ski, is always amazing. How fast he goes and how smooth he makes it look, even in super-sh*tty conditions, that’s something that completely blows my mind, it’s such a good style. It was also cool to see Leo Slemett laying down his run in Verbier. That was a really sick one. Pretty much the whole comp in Verbier was crazy. Elisabeth Gerritzen, that was such a good line. Just going so big, that’s a type of line that I haven’t seen from a girl before. Having Victor (De La Rue) take home the title, we’ve been scoping a lot, traveling and just hanging together this winter. Somehow the crew I hung out with, made it, me, Arianna, everyone! The line from Mickael Bimboes, in Verbier, stood out to me. Just going double the size off Hollywood cliff. Just full send, he would probably have dislocated both of his legs and arms if he had started tomahawking! So you were fully focused on the tour, does that mean we won’t see a full segment from you anywhere this year? I actually filmed a bit with Völkl, for the Völkl movie. We built some backcountry jumps in Austria, which was really sick. I have a few shots, I don’t know how much of a segment that’ll be, but overall, I haven’t missed filming, because I know I’ll be back filming next year. Filming is what I have the most fun doing. Growing up you were a racer, did the park or big mountain appeal more? Freestyle, fully freestyle. Racing just got stale, It’s full of rules and you get shouted at a lot. People take it super-serious, so I quit and freestyle was the next thing. Happy Dayz, was the first movie I saw. When I saw that, and actually found out that freestyle was a thing, I didn’t really want to know anything about freeride. It was all about park, every day, whenever I could. When the park was snowed in, we’d just dig out a rail and hit that, not go in the backcountry. When did freeride become an option? The Redbull Linecatcher, in 2011, was my first freeride comp. My manager told me about it, I never went into pow, so why would I want to do it? In the end, I committed to it and that’s when I really started to ride some pow, we had a really good December. I got 2nd at Linecatcher. Riding with people like Sean Petit, JP Auclair, people I’d always looked up to. That really started the whole freeride thing. Did you ever dream of doing anything, but skiing, for a job? I always wanted to ski professionally, but I never thought that I would make it and become a pro. Watching all the movies and watching the progression, I never thought I could keep up or even get to that point. Any favorites from those movies? I loved watching TJ Schiller ski and, of course, Candide, Tanner, Jon (Olsson) the 3 Phils… there are so many. I think Candide, just what he does and how he does it, we watched Few Words yesterday and I’m still blown away by that movie! The vision he brings to the game just defies everything! I met him at the Slopestyle World Cup, qualifying for the Olympics, he was super nice. I love doing comps and I’ve done that for so long, it gives you motivation to prove yourself in front of others, which you might not get with filming. I love both aspects, but if I had to choose, I would definitely choose filming. You may be Freeride World Champ, but I saw you on one of the longest rails I've ever seen last year. What was that about? Railzilla at Klausberg, my home mountain, was for the social media project, The Roadshow, the first year. I just wanted to make a really long rail, so we just put all the rails from our snow park one after the other and created a 60-meter rail. Everyone could try to hit it and whoever makes it, takes 500 bucks. It was super tough, with different types of rail, some were slippier than others, some were narrow. It was so difficult, but it was pretty fun to try. At the end, it was just Daniel Hanka and I that made it, but it was very frustrating. This year I just wanted to have something for everyone. A few rails, from really easy to super difficult. It was 4 rails, all in the same place and the beginners could shred with the pros. Really good session, everyone saw what everyone did and when somebody stomped something it was just crazy cheering. What do you do when you’re not skiing? Any plans for what you’ll do after your ski career? I climb a bunch, I skate a bunch, biking of course. This summer I’m going to try some filming and do a little clip myself. Behind the camera and editing, like a little documentary, I’m pretty psyched about doing that with my friends. I have no idea what I’m doing after skiing, I hope I’m gonna ski for a long time still. I’d like to try filming, but I just don’t know how good I am at it! You’re Italian, but you’re from the South Tyrol, a pretty German part of the country. Do you do anything stereotypically Italian? I don’t think I do anything that is that Italian. Where we live we have the autonomy, which are special rules about a number of things, one thing is that we speak German as our first-language, to maintain the culture of this place, so we are basically in our own little world here. I make pasta and pizza, of course, but I don’t do anything super-Italian. Thanks Markus, congratulations on the FWT again. What’s your next ambition in skiing? Trip: Georgia, in the Caucasus mountains. 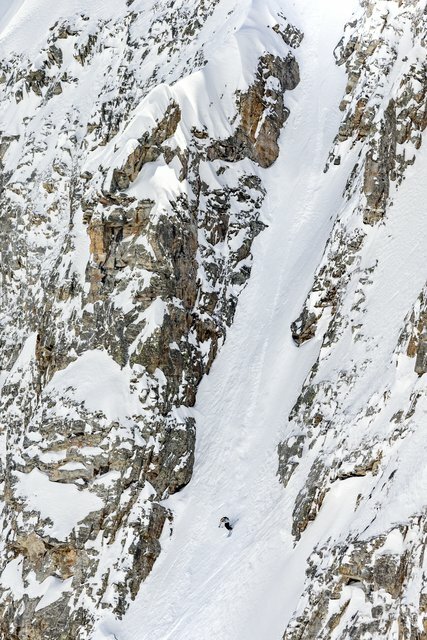 Me, Sam Anthamatten and Leo Slemett went there with The North Face and just had Alaska-style heli-ski conditions. It was incredible, just like Alaska, but nobody around, no film crew, no other heli-skiers, nobody, just us. It’s a really cool culture over there. Trick: Cork 3 over a cliff. I can do it anywhere, when I just go riding for fun, I don’t even scope the line and it always feels good, no matter what. Track: All Good by Illa J. I listen to it if I’m nervous before the comp, or the day before. I listened to it the night before Verbier.